Many cyclists on the SF Bay Area Peninsula (i.e., Palo Alto/Woodside/Los Altos region) seem to know their best time up Old La Honda Rd., as it provides some measure of one’s climbing aptitude (both relative to your previous self, and to others). The official start of the hill climb is the stone bridge (I presume it is the leading, and not the trailing, edge of it); the end is the stop sign at the top of the intersection of Old La Honda and Skyline Blvd. The course record, according to various posts on USENET newsgroups, is a few ticks under 15 minutes (14:50 or so), and is either owned by Dr. Eric Heiden (the Olympic speed-skating champion who lived 2/3rds up Old La Honda), or a guy named Mike Murray. These are results from the 1995 Low-Key Hill Climb Series (now defunct, sadly), that you can also compare your times with. Again, I found this from a USENET newsgroup. Presumably, the people who entered the series were typically “above-average” (or at least, enthuasiastic) hill-climbers. Fisher, David       Alto Velo/ALEVE     m   5                 ????? Paulsen, Anne       Western Wheelers    f   None              ????? Chang, John         NA                  m   None              ????? That, I think, is about the same as your record! Dang, you were in really good shape back in ’97! I was a little disappointed that I couldn’t break 20 minutes (and actually wasn’t even really close), which was my goal. However, I take solace in that I was 4 minutes faster than my last timed OLH climb (in ’94), and I think I can do a bit better by doing things differently. First off, I think Mike and I stopped too long before starting the climb, as I had really cooled off by then. As I consistently notice when doing hill repeats on Morrison Canyon Rd., I climb significantly worse on cool legs (usu. for the first time up). Secondly (and probably most importantly)… I started out going way too fast. At the bottom, I was going like 15mph, and just sped by some other cyclists who started like 5 minutes before Mike and me. By the middle of the climb I was already hacking my lungs out. I was really not well and had to take a slug of water every minute or so due to the hacking. I never really recovered, though I’m happy that I managed to keep a pretty consistent pace for the last half of the climb despite the suffering. Thirdly, when I get to know the climb better, I would ideally start speeding up sooner at the end (e.g. go anaerobic at that point). I started sprinting when I saw the mailboxes, but that’s a little too late. And finally, ideally I would do this on a cooler day… today was not bad, a little on the warm side for something like this. This is a nice page. One missing item that would be nice to include is the distance from the stone bridge to the stop sign at the top, the grade, and the elevation gain. But thanks for what’s here. The top time listed for the OLH hillclimb….14.833 min. works out to a vam (average ascent speed) of about 87 ft./min. this is actually very good, however to put it in perspective the vam for the 5360 vertical ft. of Mt. Ventoux in France is about 96 ft./min. set by Iban Mayo a few years back. Yeah, OLH Road. I’d stopped riding for 15 years, then started up again summer ’05. First time up: 38m. Now at 24.5m. I love this climb; know the house #’s, names of the horses in the corrals, real estate prices, Upenuff you’re almost there, that lousy rough patch at the top (WHY hasn’t it been repaved??) etc. Great job on this website! For those interested LKHC has started up again and your chance to beat the clock up OLH is this Saturday 21OCt06 see attached link for more details. Regarding: OLH fastest times…I rode OLH regularly in the late 70s and early 80s. It was definitely the benchmark time trial climb for Category 1/2 USCF riders. It was the stuff of legend to hear times of sub-17 minutes during those days. I can vouch for only three riders in that category (myself included) and believe that Eric Heiden’s time was to his house NEAR the top and not all the way to the stop sign. I remember riding with a small group and we did the OLH/Skyline/84 “circuit” three or four times one morning. I recall my times being sub-19 for each “lap.” Considering how much lighter bikes are nowadays, I’m surprised that times haven’t improved much beyond the high 16-minute marks I’ve seen. Does anyone have a definitive list of “best OLH times?” I’d be curious to know. These are the results from the 2006 low key series. I did it in 17:01, an I am just a local no-category hill climb enthusiast. My understanding is that any Cat2 rider should be able to do it under 17. These LOW KEY HILLCLIMB results are helpful, although not comprehensive. My hopes were/are that someone has put together a list of BEST TIMES up OLH, King’s Mtn., Hwy 84, etc. I can personally vouch for 16:27 up OLH, 18:54 up King’s (from the split), and 12:35 up 84 from the base of Portola Rd. (at the hairpin). The problem with the best times is that they are often not documented, and are anecdotal. The only way to get semi-official data is from race results like Low Key. The Stanford cycling team has a race up OLH in December (? ), and I’ve never seen the best time crack 16 min. I personally know 3 people who can crack 17, and know of noone who can crack 16. Perhaps, if the LOW KEY series survives for a number of years in a row we will have a decent statistical data. Perhaps you should join the race thus year? With 16:27 (is that self-timed?) up OLH you could win (or even crack 16 min and set another PR?). This map at Palo Alto Bicycle states the record time is under 14 minutes. Given that Basso climbed Ventoux at 96 vertical feet per minute that is consistent with what a top pro could do. 90 VFM = 14:20, 96 VFM is under 13:30. A rider and bike weighing 170 lbs pedaling at 80 rpm expending 380 Watts up a 7.2% grade would need 63.64 gear inches (42-18 = 63 gear inches). The rider would be climbing at 15.14 mph which would climb OLH in 13:21. This is from someone who had trouble getting up OLH with a triple I rented at Campus Bike Shop in August and was toast on the road up Mt. Wachusett (Massachusetts) in June pushing a 42-24. “Discovered” Old La Honda last year, riding it on a 30 x 27 Zurich. Nice ride but it took me at least 35 minutes to the top (age: 56). Several weeks ago I started riding up on my fixie (39 x 20) and shortened my time substantially. Of course, I find myself standing up quite a bit! Old La Honda is an absolutely wonder on a fixed gear bike, as long as you switch to freewheel before coasting down to Alice’s and back to Woodside. What currently “works” for me is a 39 x 23 — and it just rocks! This site inspired me to give it a spin with my teammate from Godspeed last week. Is the hillclimb series still going on? Someone on Webcor said it was, informally. I’d love to try it in some sort of competition. Friendly or unsanctioned. Whatever. And the descent is lovely too. the descent down 84 is way better than OLH. I find OLH too narrow going down, with too many blind curves. i am a complete novice biker, and i love OLH (36ish min for me … trying to get into the low 30s this season). what i love even more is to cool down by heading west on 84 afterwards and coming back up the backside of OLH … it’s a left turn about 3 miles out on OLH and it’s a beautiful, easy 2.5 mile blip up. oops … i meant 3 miles out on 84 west. I wish I could claim 18 min, but so far its 24. I want to bring it down to 21. Anyone interested? Hey, I ride Kings/OLH 4-6 days per week and would welcome someone to ride with. M-F I usually ride at 9:30am, and on weekends we’ll start sometime between 2 and 4 pm. There are just two of us, and we’re really trying to get under 21 for OLH, and I think we’re close. Please let me know if you would want to meet us sometime. RE: OLH time trials, in 1980, I rode a Campy Record-equipped Raleigh Professional 531 steel frame with clinchers using a 42×17 mostly and shifted to 42×15 toward the top after the water tank. I had water bottles, frame pump and tubes onboard. Pretty heavy compared to today’s super lightweight bikes. Sometimes, I would ride a fixed gear road bike that had a 52×19. It was tough going but allowed me to push a BIG gear when racing. The road was extremely rough compared to what it is today. My fastest timed by another was 17:13 (by Western Wheelers at the bridge), but I did multiple self-timed 16:50s and one 16:30 in 1981. I would think today’s times would be MUCH faster. At 165lbs, I was fairly large for a climber but I also excelled in ITT doing a 54:23 for the 25mi ITT in Sierraville. So, after a year at 8,500′ ASL, and at age 49, I’m in Davis and ready for some time trials up OLH again on my carbon fiber steed. Let’s get it on after the New Year!!! Here are times from the 2009 Low-key Hill Climb Series…wow!!! On April 9, 1981, I raced Dave Mac up OLH. I had a stopwatch on my handlebars. Ray Hosler started his own watch at the bottom (this was at the stop sign, not the stone bridge), then drove up to time us at the top. I did 16:53 that day (Ray’s watch and mine agreed), climbing all the way in a 42-17 off the saddle. Dave did 18:42 but he was young then, and within a few years would prove to be a top notch climber, winning the King of the Mountain at Mt. Hamilton in 1986, I believe, and also winning Pinkie’s Road Race with a daring move on the final gravel descent. A couple of years later, I challenged Brian Spitz, the framebuilder, to a race up OLH. The last I saw of him was about a mile from the bottom, dancing away from me in a pretty small gear. He did a self-reported 16:18, which I fully believe — he was an ex-cross-country runner who was an awesome climber. Then there was the time Dave McLaughlin and I rode up just after a big storm in Jan. 1982, I think. There was a huge mudslide about half a mile from the bottom. We got off our bikes and walked through it. My cycling shoe got sucked off and we dug in the mud for the next 5 minutes looking for it. Mac came up with it and we kept going on the ride. There were no cars on the climb that day!! A couple of years ago I visited the Bay Area and rode up OLH in 23 minutes. Oof! The joys of aging! If I ever manage to beat 20 minutes again, I’ll log in! just did OLH on my commuter fixed gear. 40 min to the top with a 53 x 16, fenders, thermos of coffee, and 32c Vittoria Randonneur tires. Saw some awesome riders sprinting past me, passed a few myself. See yall out there on the hill. Back in the eighties Eric H. lived in a couple places on Old. If he timed his run from the stop sign to the place on Upenuf that would make sense. I was climbing pretty fast in those days and had a personal best of 15:50 from stop sign to stop sign. I timed it with the stopwatch in an Avocet 30 Cyclometer. I remember that day when Brian and Fausto dueled it up Old. We all worked together at PAB. Brian started racing, but he wasn’t motivated to keep it up. Brian could do it all and I think if he stuck with it he would have been great on a national level. My racing days were erratic at best. Some days I just flew, others tanked. This is mid eighties. Mike Engleman came along and we moved up from Cat 3 to 2 at the same time. While he soloed in way ahead of us, I would get 2nd or third. Once we were Cat 2, the same held for Mike, he soloed in on nearly every road race until turning pro. I stayed mid pack to top 10 a few times. Good memories all in all. Just rode OLH for the 1st time this morning, in part motivated by the great stories on this site (nice work, Felix). Will be back & aiming to break 30:00 for starters. I rode OLH again at age 50! 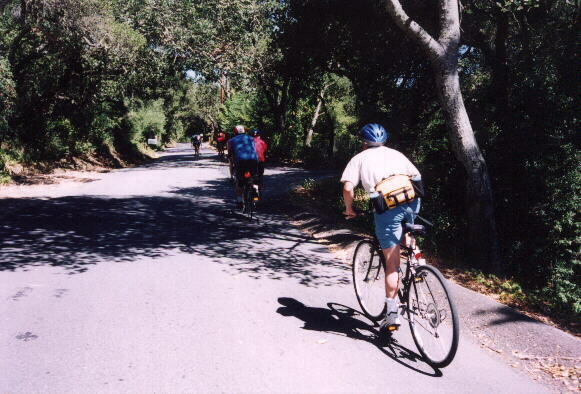 I grew up in San Mateo and rode it often. Now, I live in Davis but visit the Peninsula regularly. I remembered every turn, every mailbox and every tree from stop sign to stop sign. What a great ride. I can’t believe how many riders clog this road and disrespect locals, motorists and even other cyclists! What a disappointment. But, my time was enjoyable: 19:24 at age 50, at around 175 lbs on a TREK OCLV 5500 w/DuraAce bought in 1997. I love my life. Keep riding. Something’s working for us. There were earlier comments about the Stanford cycling team’s OLH times. The current best time by a student was set by Eric Lau in 2010 with 15:20. Rand Miller and Evan Pickett were also sub-16 with 15:52 and 15:50, respectively. Sorry, I made an error, Eric Lau’s time was 15:27. Still blindingly fast! Wow, that was really fast all right. Thanks for posting some of the Stanford cycling team’s OLH times! As of last weekend, Stanford Cycling has a new OLH record. Keith Wong climbed it in 15:18! wow, 15:18! Did they finally re-pave the last 200 feet of it? 🙂 Glad this thread is still going. Yep, that last bit is all smooth now. So much nicer (and definitely faster)! I stopped just 2ft into the driveway at the house near the Garden Exchange, just to check my path. The lady at the house said she was going to sick her dog on me. And someone else said bicycles are not actually allowed on that road. Hah, well whoever said that is projecting his dreams into his reality. Unfortunately, in the real world, bicycles are allowed on all public roads (that aren’t limited access highways). Ha. Poor lady. She will have to move or she will have a premature heart attack. Wrong place to live if you don’t like cyclists. I have climbed OLR with two different McBrides, Fausto several times, and a time or two with Dave Mac, I think Fausto and I might have ridden it together the fastest that I can remember on a ride to Halfmoon Bay and back via the Pinkies course. Definitely one of my life highlights. OLH is a great climb! I’ve been using the Strava mobile app to track my time up OLH (and my full ride) and it’s been a great tool, highly suggest it for your rides. It shows over 20,000 rides from ~3,200 riders that have been hitting the hill. My times at 25 minutes, which earned me a place of about 1,500 of 3,200 riders. Check it out, its great for benchmarking your rides and pushing you to do better! And it’s free. I want to thank everyone who posted here, you are the ones that motivated me to climb OLH. I have done it a few times but never timed myself. A couple of weeks ago I had an informal 32 minutes, but after reading these messages and pushing it a little bit this morning, I was able to break 30 minutes at 29:40. And I turned 60 in March…thanks for all the help and motivation. Thank you all too BUT darn! This page is driving me crazy. Been riding it lots recently but try as I might I still can’t seem to get under 25mins on this OLH climb. This morning I felt stronger and like I was finally going to make it but I ended up fading slightly and doing only 25:50. My PB is ~25:20 and I am 54 years age., 6′ tall, ~180lbs, bike is ~16lbs. What is the secret folks? Am I just “over the hill” at 54 or did I just not choose my parents carefully? I seem to be improving my riding speed nearly everywhere else. @ Robert L. Here’s what was suggested to me over 35 years ago when I was a competitive swimmer: “Form is first, fast is last…speed will come.” Another concept, told to me by a young fellow named Greg L. who became a TDF winner, were the 3T’s: “Training, technique and tempo.” Just offering this up. Grins. But actually I’m thinking now that I may have simply over trained and plateaued for a while recently. Been taking a bit of a break for several days and my last ride on Sunday (although not up OLH) showed much better improvement. So I guess that it is worth adding on here “don’t over train”. Great to here that George and very encouraging. Thank you! I plan to keep riding now for as long as I can – I’m very happy with the weight loss and various other changes that I have had already as a result of doing something that I find is also great fun. So funny! Hope you are well! To Dave Brown from the May, 2012 comment: Are you the same Dave Brown who was married to Vicki and hated the smell of my tuna melts at Palo Alto Bicycles? My e-mail is faustd@mhcc.edu if you want to “catch up.” Hope you’re doing well! That was me Dave. I am doing well. You? I will send a PM. I just knocked off 1:40 from my previous best to come in at 25:21 (strava measured). Thanks to Dirk Bergstrom/Alto Velo Egan ride. 58, 152lbs, More minutes to go. Great job Stuart. Keep it up! It’s nice that we now have Stava for these climbs nowadays versus hand timing while I was in college.